ATTENTION in the 1st week the MORNING lectures are taking place at the Leonardo building, Budinich Lecture Hall. All AFTERNOON sessions and the 2nd week will take place at the Adriatico Guest House! The ICTP regional climate modeling system RegCM4 is currently participating to the CORDEX-CORE initiative, which entails the completion of a new set of downscaled climate projections over most CORDEX domains for two greenhouse gas concentration scenarios (RCP8.5 and RCP2.6) at a horizontal grid spacing of 25 km. 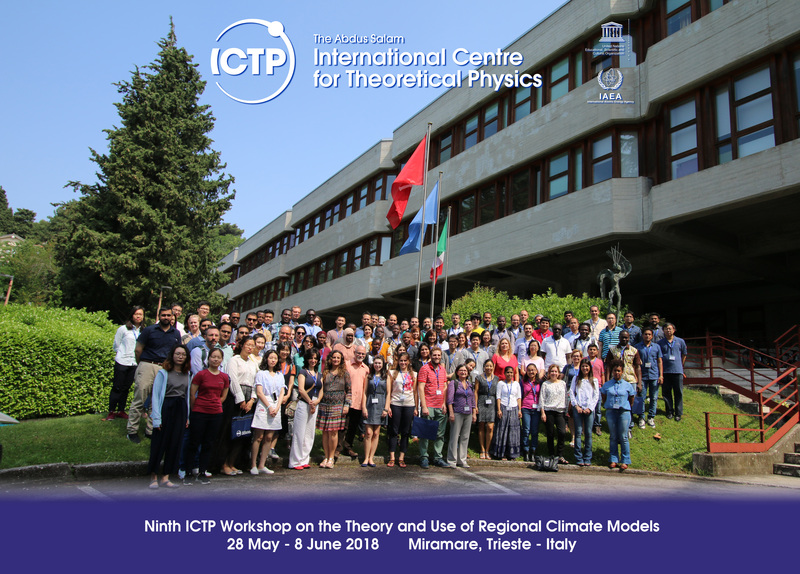 These projections are being completed at ICTP as well as other laboratories using the RegCM4 model, as a community effort aimed at producing climate information usable for impact assessment studies and contributing to the activities of the Intergovernmental Panel on Climate Change (IPCC). It is expected that by the date of the workshop a number of new projections will have been completed for multiple domains, and therefore the workshop will be an optimal venue to analyze these projections and exchange experience across different domains and regions. As in previous workshops of this series, this event will provide lectures and extensive hands-on sessions on the theory of regional climate change and regional climate modeling as well as the use of the RegCM modeling system. The focus of the present workshop will be on the analysis and interpretation of the output of regional model projections, addressing issues such as : assessment of model performance, performance metrics a and model systematic errors, identification and quantification of added value, study of phenomena relevant to different regions, uncertainty in projections and their dependence on model biases. The workshop will also provide a forum to discuss the production of scientific publications by the RegCM user community participating to the CORDEX-CORE effort, particularly in view of relevant IPCC deadlines. Experience with the RegCM modeling system and with the analysis of regional model output is an important requirement for participation. The workshop is intended for scientists and graduate students working in the areas of Atmospheric Physics and Dynamics, Climatology, Oceanography, Physics and Mathematics.